Repeat after me "housing and cars and part time jobs, oh my". There's little else worth cheering about, not even the stock market lately. And housing is not all that strong either. Today, the Dallas Fed reported that activity in its region plunged to a reading of -15.8, well below any economist's prediction. The Bloomberg Consensus range was -8.0 to +0.5. Nowhere are the effects of the oil-patch rout more evident than in the Dallas Fed manufacturing report where the general activity index fell to minus 15.8 in August from July's already weak minus 4.6. New orders fell into deep contraction this month, down more than 13 points to minus 12.5 with employment, at minus 1.4, in contraction for a fourth straight month. Hours worked are at minus 6.3 while readings on the business outlook fell steeply though both remain in slightly positive ground. 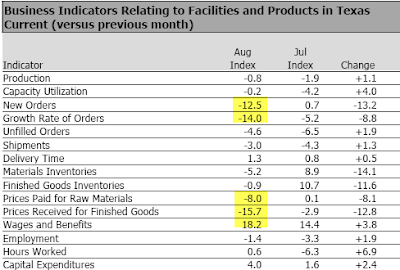 Less weak readings were posted by production, shipments and capacity utilization. But price readings are very weak, with raw materials at minus 8.0 and finished goods at minus 15.7. It really doesn't get any worse than this report which points to increasing drag from the energy sector. Note that wages and benefits are up big, while prices received and new orders are in deep contraction. The above table from the Dallas Fed Texas Manufacturing Outlook Survey. The strength of the dollar is impacting us through an inability to export and high volume of imports. The price of finished product dropped dramatically. New orders have dropped to half of what they were last year. Capital project equipment continues to be sourced in China and Korea as the owners are chasing every dollar of savings possible. We had our first layoff in 15 years. We are currently experiencing a large surge in the automotive industry due to our relationship and close proximity to an automotive plant during a new vehicle implementation period. It seems like if you are in a position to take on work and able to turn it around quickly there seems to be plenty of small to medium-range quantity types knocking. We are hoping that as oil prices continue to fall, food and other commodities fall also. A little more deflation could certainly help. Our oil and gas business, historically 50 percent of our revenues, is still down. Inventories have been consumed fairly well, which now offsets the second drop of oil prices. The growth we expect is due to our efforts to grow our non-oil and gas business. The continued decline in the West Texas Intermediate crude oil price is expected to soften the demand for our basic fabricated products. The volatility in the stock market and decreased energy costs always have a negative impact on replacement windows orders. Even though there is a substantial decrease in raw material prices, capacity levels in PVC and glass are extremely constrained. The reason for the decreased capacity levels is that during the housing crisis no capital expenditures were made and now most vendors are at full capacity.